One of the TOP Internet Radio Station’s in the United States. With THREE branch locations we strive to play the best indie music, rising businesses & Owners and HOTTEST NEWS. Welcome To The #MixxyMondays Music Show!! *NEW INDIE MUSIC and more!! Support Your Favorite Indie Artists, And Spread ... See More The Word To Others! Look Forward To Hearing From You And Enjoy The Show!! EVERY WEDNESDAY TUNE INTO 'Pride Wednesday's'!!! We're giving you the HOTTEST LGBTQ Artist around the world, National & International! Thank you to ALL the Artist at the Mixtape Release Party. Shout Out to Ruff Ryders Recruit Brillo & The Ruff Ryders General. Thank You to the Ciroc Boyz Philly for having No Sugar Radio cover this amazing event. More events coming soon. 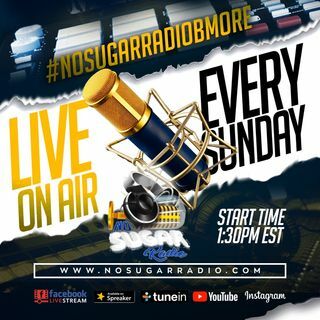 Tune into No Sugar Radio EVERY SUNDAY at 1:30pm EST. Any Artist looking for Radio Spins ... See More or Artist Interviews please email us at NoSugarRadio@gmail.com.